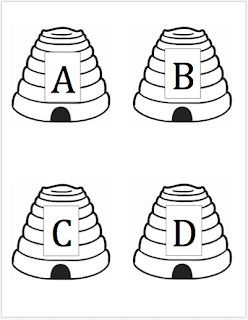 ABC Beehives: I would recommend printing these on cardstock and then cutting them out to make each beehive a separate card. 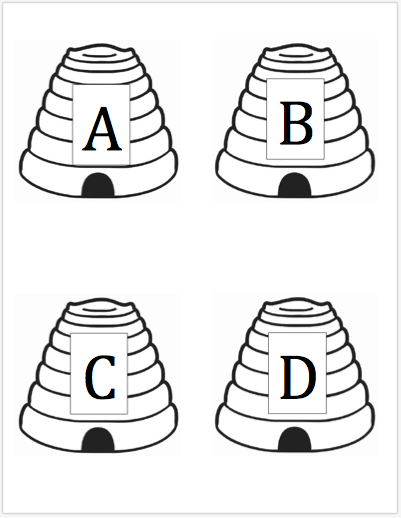 You can find the whole beehive alphabet here (along with the blank bees). Once you've cut out the beehives... spread them out on the floor around a room in your house or in your classroom. Or tape them to the walls if you don't want kids stepping on them. 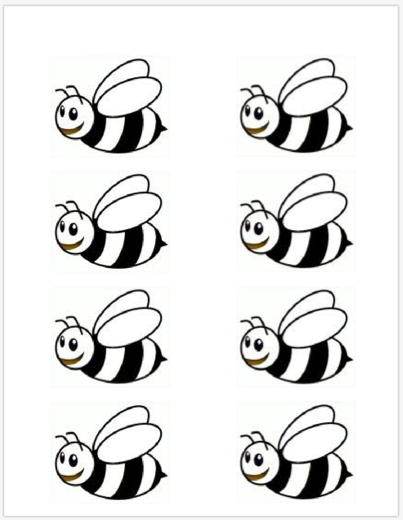 For younger kids, print out the set of bumble bees and write a different letter of the alphabet on each bee. Cut out the bees. Have the kids each get a bumble bee and fly around the room to help the bumble bee find it's matching ABC hive. I will probably write lowercase letters on my bumble bee wings and have my son match them to the uppercase ABC hives. 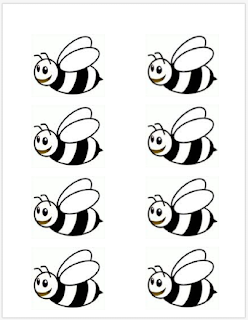 For older kids, print out the set of bumble bees and write simple words on each bee (related to a bee-theme or just interesting words to your child). I am writing the words on the front wing of the bee. Then cut out the bees and have the kids fly around and match the words to the correct beehive. Add a little tape to the back of their bee if you're worried it won't stay by the hive as kids prance around. Velcro (and laminating all the pieces) would be even better if you want to keep this game. You can play in several ways. You can have kids match the beginning letters, middle letters, or end letters of the word. For example, if your word is fly, you could say, "What is the first letter in the word fly? Find the beehive that matches..." Then move to the end of the word. "What is the last letter in the word fly? Find the beehive that matches that letter..." And on and on. Be creative. I'm sure you all can find even more fun ways to use these. We plan to flit and fly all around our living room when we play this game tomorrow. We may even sing our favorite bumble bee song and dance from hive to hive. If you have another version of this or a similar game you play, please share!! I have a feeling I might be making a version with volcanos and dinosaurs tomorrow. :) If I do, I'll pass along the free printable to that as well.